The gator climbed a flight of stairs and pushed through a screen door to get to the porch. 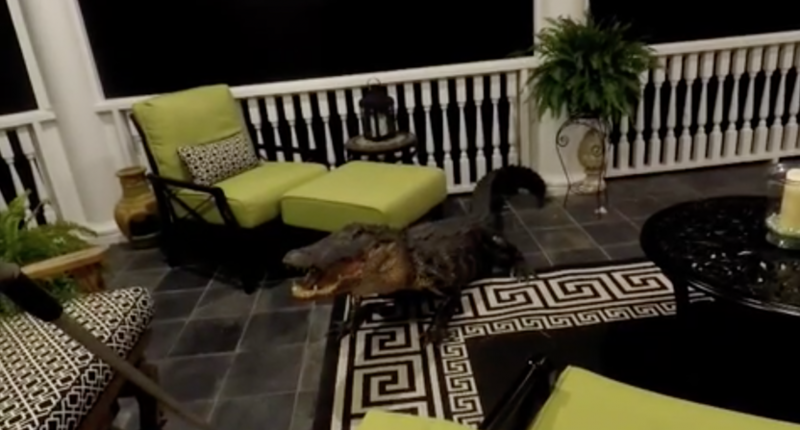 How do you get an alligator off your sun porch? It turns out no one really knows. On Sunday, the Polston family in Mount Pleasant, South Carolina heard a noise in their house and assumed it was a burglar. But when they investigated, they found a nearly 10-f0ot alligator hanging out on their porch. According to The Post and Courier, which has video of the scene, the reptile had climbed a stairwell, pushed through an aluminum screen door and settled in by the sofa. And it wasn’t easy to get it to move. And the monstrous critter wouldn’t budge, even though a nuisance removal agent spent two hours trying to coax it out far enough from the porch to snare it safely. “A 5-footer, we could have put a dog stick on it and dragged it out,” said agent Ronnie Russell, of Gator Getter Consultants. “One that large, he likes to grab onto things (to fight. )” As Russell worked outside, the family inside dragged over household furniture to barricade the door. “There was not a whole lot of room up there (on the porch),” Russell said. Per The Post and Courier, it’s not unusual for alligators to approach homes in that part of South Carolina, though it is certainly not common for them to climb stairs and push through screen doors. This story does not have a particularly happy ending. After the nuisance removal agent failed to get the alligator to budge, the Polstons had to decide between having the animal killed or waiting, maybe days, until it felt like moving. Reluctantly, they chose the former option. R.I.P. to an alligator who wanted only to enjoy the indoors.